Today is all about two of my favorite tops: organization and things that keep my kids quiet happy! I had seen so many fun Pins about art carts and art stations for kids and wanted to do something similar. An art station wouldn't work for us because my kids are constantly rotating from room to room and can't stay in one place for more than five minutes. Art station on wheels became a necessity and therein lies the mobile art cart, generally stationed in the office, but always on the move. 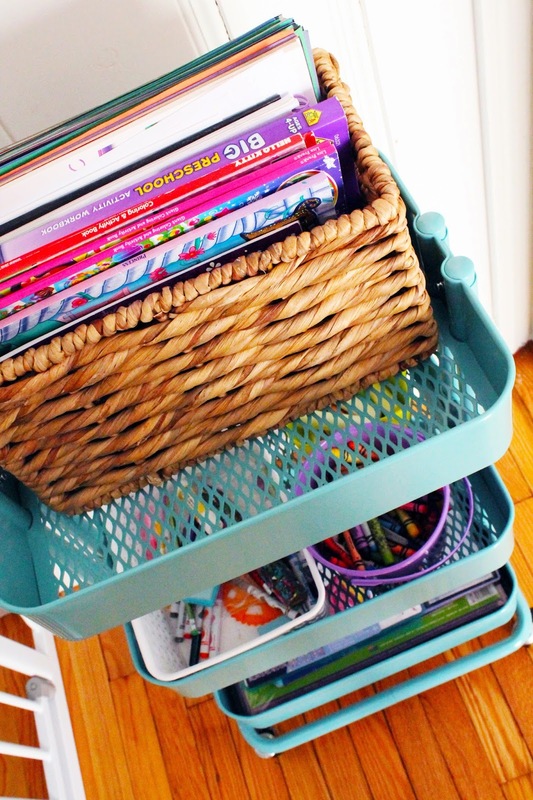 The top shelf has a basket that includes note pads (the kids love them), coloring books, a clipboard, loose paper, and art books. The second shelf is courtesy of the Target dollar spot - their bins are the BEST holders. One has chalk, one has crayons, and the other is the hot mess bin with markers, glue, stickers, etc. They literally were messing it up as I was taking these pictures. The bottom holds an art kit, chalkboard and oversized coloring books. It's not much, but it makes me and the kiddos VERY happy! 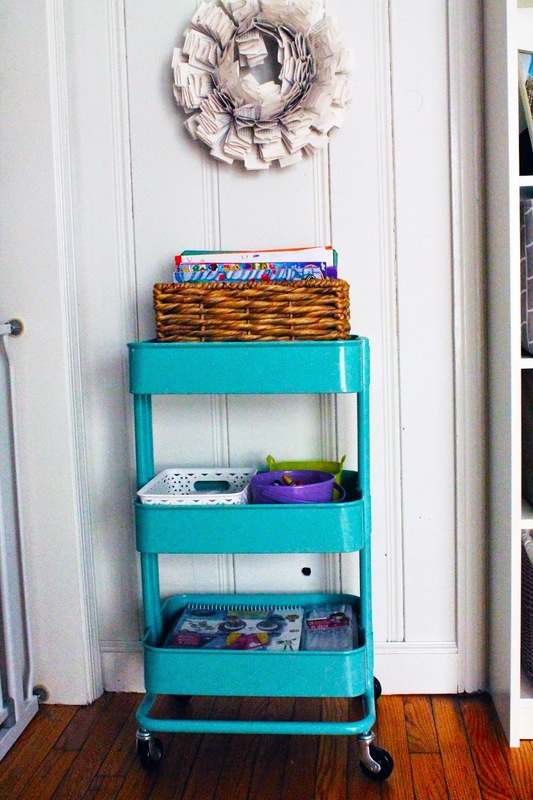 I'm happy because I love turquoise and it's organized (it's the little things, obvs!) and the kids are happy because they can easily access their supplies and move it from room to room! Great idea to have a cart!! I love that they can move it from room to room easily and you're not lugging art stuff around the house all day in different bins. Ugh I need that IKEA cart in my life! And when I get a new house can you please come decorate it for me? Every picture I see of your house has me in love with your decor! I don't even have kids yet, I just want this for myself! So cute and organized! So cute and I love the color! Thank for sharing! This is all kinds of cute! I'm totally pinning this!